Laura Bang, Digital and Special Collections curatorial assistant, and Michael Foight, Special Collections and Digital Library coordinator, (pictured) organized Villanova University’s recent table presence at the Public Library Association (PLA) 2012 Conference held in Philadelphia, Pa. The biennial PLA Conference is the largest conference devoted to public library professionals in the United States. The University’s table in the exhibitor’s hall promoted two open-source software projects developed at Falvey Memorial Library: VuFind, a library resource portal, and VuDL, a digital library content management system. Bang and Foight were joined by Diane Biunno, David Burke, Alexandra Edwards, Chris Hallberg, Demian Katz, David Lacy, Brian McDonald, and David Uspal. 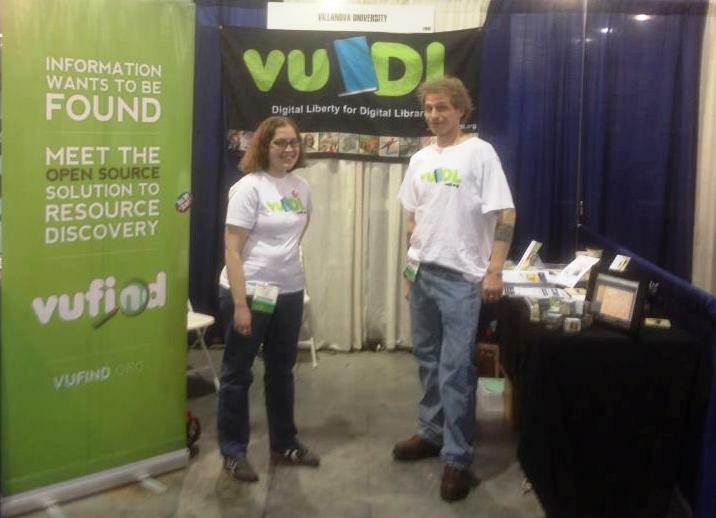 The team shared information on VuFind and VuDL, including our recent partnership with the Free Library of Philadelphia, with the more than 8,700 conference attendees.